While you’re tucking into your popcorn at the theater this week to watch the latest iteration of the Star Wars franchise, consider what it is that Star Wars can teach brands about the enduring power of storytelling. 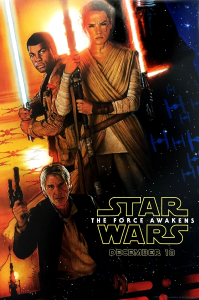 What, you never thought to apply the storytelling principles of Star Wars to your marketing efforts? Read on, my friends. Archetypes can still do the heavy lifting. There’s a reason that archetypes exist: the hero, the martyr, the villain, the healer, the mentor, the monster. Darth Vader and Luke Skywalker epitomize their respective archetypal classes, and make it easy for audiences to leap into the story without much explanation. When speaking to audiences who have shorter attention spans than ever, brands need to find ways to capture attention and communicate messages without a lot of back-story. Once the consumer is hooked on your story, you can take more time to flesh out your characters – whether that character is a stand-in for the consumer, a mascot, or a superhero. Characters with problems are compelling. The re’s a reason we love to hear about problems. Problems mean conflict. Conflict is compelling. What will happen to Luke now that his aunt and uncle are dead? Who were his real parents? Will Leia escape Darth Vader and successfully lead the rebellion to victory? Your brand story may not seem to have such high stakes, but for a consumer making a healthcare or even a transportation decision based on your marketing efforts, it can indeed be a life-altering decision. We’ll follow characters we love anywhere. Most brands realize that cultivating brand evangelists – folks who love your brand so much that they recommend you to others – is one of the most difficult but successful ways to grow a business. How do you get people to love you? Appeal to their emotions. This is something we forget a lot as marketers in our clamor to offer more coupons and lower prices and pithy headlines. At the end of the day, humans yearn for connection. When that connection happens – with Luke, Leia, Han, Vader or your brand – magical things can happen. Symbolism isn’t dead. George Lucas wasn’t afraid of symbolism. In fact, he was a big fan of Joseph Campbell, the mythologist, writer, and lecturer who studied the recurring stories and symbolism shared across cultures. By tapping into these symbols– from the mysterious Force which gives all things life to the black and white clothing choices of heroes and villains – Lucas was able to evoke our conscious and unconscious associations to deliver greater meaning and emotion. Does your brand use symbols of closed doors to advertise a software that’s supposed to deliver more sales opportunities? Maybe rethink that symbolism. Everyone is the hero of their own story. No matter who you are – Stormtrooper #6 or Focus Group Participant #9 – you’re the center of your own universe. Placing your customer at the center of your brand story will end in a more positive result than trying to put your brand center stage. What does it look like when everyone gets to be the hero of their own story? When characters we love want something, we do too. What do the people you feature in your ads want? What’s standing in their way? Do they get what they want? These are the three pillars of storytelling, and adhering to them can get people on board with your message. Whether it’s wanting cleaner clothes, a better ride, or to be the best Jedi ever, we’re all looking for something. People remember how you made them feel. Star Wars doesn’t tell the world’s most original story, but it tells it in a new way that grabs both our attention and emotion. Sometimes brands focus too much on trying to be original and creative while forgetting that there are universal stories that can be re-imagined and retold in new ways that evoke our deepest emotions. At the end of the day, whatever your brand story is, what we’ll remember is how you made us feel. That’s why it’s so important for brands to associate themselves with good, positive actions and emotions. For many of us who saw the original Star Wars films as children or young adults, what we remember is a sense of hope, awe, and adventure. We remember the journey of characters we love. We remember a simpler world as we once believed it to be, and how our journey to a galaxy far, far away not only changed Luke and Leia and Han and Vader for the better, but changed us for the better, too.